Crowdfunding is sometimes thought of as a last resort for gimmicky business ideas, but there’s much more to it than that. The many different crowdfunding platforms serve a variety of financing roles. Perhaps there’s an option to suit your clients. Crowdfunding is a way for your clients to raise business capital, either by pre-selling products, giving gifts or, in some cases, selling equity. Crowdfunding platforms are estimated to raise more than $30 billion a year. It’s a highly organized community and, because it’s online, successful fundraisers get instant access to their freshly raised capital. Raising capital to launch new products or fuel business growth can be challenging. Banks often need to see an established cashflow, or require significant collateral to borrow against. Angel investment and venture capital are alternatives, but they generally come with strings attached. Investors want to be involved in business planning and decision-making, which might scare your client. Crowdfunding is the “other way” but you shouldn’t think of it as a last resort or a long shot. It can generate capital while leaving your client in control of their business. CrowdFund Beat lists some of the hundreds of crowdfunding websites but it’s by no means exhaustive. If a client asks you about crowdfunding pros and cons, start by explaining that there are many alternatives. What will your client have to give up? Crowdfunding is a legitimate way for your clients to raise capital, but they’re going to have to give something up to get the cash. When you brief them on the pros and cons of crowdfunding, you’ll need to explain the different relationships between fundraisers and investors. These will change depending on the type of crowdfunding they pursue. Backers give a small amount of money in exchange for a non-financial reward, such as products, discounts or early access to products. Backers make a loan to your client’s company, which must eventually be repaid with interest. Backers invest significant amounts of money in your client’s business in exchange for equity. There’s also donation fundraising for social projects. 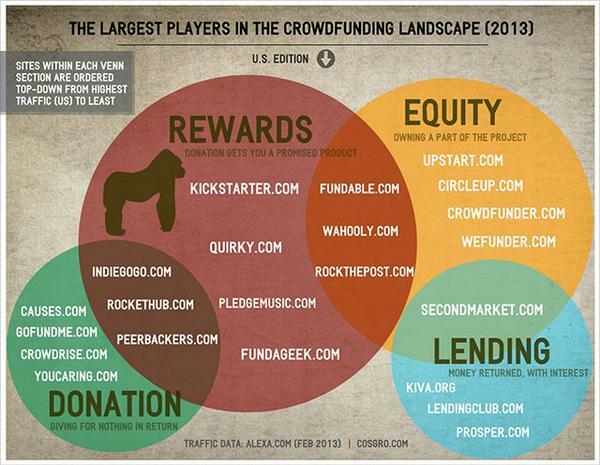 You can use this diagram to help explain the types of crowdfunding to your client. Lending-based and equity-based crowdfunding mimic traditional financing models, but with important differences. Rewards-based finance is at the heart of most crowdfunding media stories and is probably the best-known model. It tends to attract micro-financing, however, so success is reliant on motivating many people to back a project. Your client can choose to go for a lot of micro-investors, which is a popular approach in the crowdfunding world, but it can be a lot of work. You have to inspire many people to reach into their pocket. If your client would prefer to go after bigger investors, they’re probably going to have to give up equity. In this sense, crowdfunding can start to resemble a venture capital or angel investment model. The more business-focused platforms always make it clear when equity is expected. Chat with your clients about how much control they’re willing to give up in order to access finance. Whether your client is a startup or an existing business with a new idea, putting their IP in the public domain is a risk. There aren’t any non-disclosure agreements or confidentiality agreements to protect them. Anyone could take the idea and improve on it, or come up with a superior marketing spin to develop their own project. If your clients offer equity shares to crowdfunders, it can complicate future investment opportunities. Larger investors could be reluctant to get involved if there are too many shareholders in the company. So if your client succeeds with crowdfunding in the short-term, it may be harder to obtain more structured finance later. That could leave them stranded if they need more capital in the future to take the next step. It can be harder to access micro-funding for B2B products or services. Smaller funders generally won’t have the industry or market knowledge to invest in that space. They’re more comfortable with consumer products, where they can easily understand what they’re investing in. Crowdfunding is a legitimate and legally acceptable platform in most countries. In 2012, the USA introduced the Jumpstart Our Business Startups (JOBS) Act which included special provisions for crowdfunding. This meant businesses could raise equity-based capital without having to register with the SEC (Securities and Exchange Commission). However, this doesn’t mean your clients are immune from legal action being taken by disgruntled investors. And because more investors are involved, the potential for disputes to arise is greater. If your clients decide to use crowdfunding, they need to prepare for success. Ask them what they’ll do if there’s a flood of interest. They need to understand that interested investors will want to do due diligence. Your client should have a business plan that demonstrates a thought-out strategy and a plausible path to market. There’s a temptation to think of crowdfunding as a marketing exercise but there has to be substance behind it. You’re an accountant, not a marketer, but interested clients will probably ask you how to create a crowdfunding campaign. For more advice on how to create a crowdfunding pitch video, send them a link to Josef Holm’s LinkedIn column 10 Tips for a Successful Crowdfunding Pitch Video. Crowdfunding is often remembered for the freak campaigns that get media coverage. And because of that, we think something has to go viral to succeed. But that’s not true. Crowdfunding provides the backing for a lot of perfectly typical business ideas. Think of crowdfunding as a platform for reaching hundreds or even thousands of ready investors with one pitch and it suddenly makes a lot of sense. Just remind your clients that the principles of attracting investors remain the same here as anywhere. They’ll need a professional pitch, backed up by a coherent business plan. And you’ll need to help them create forecasts, graphs and charts to help illustrate the venture’s potential.